Give a sweet (or spicy!) gift in a marvelous mason jar! 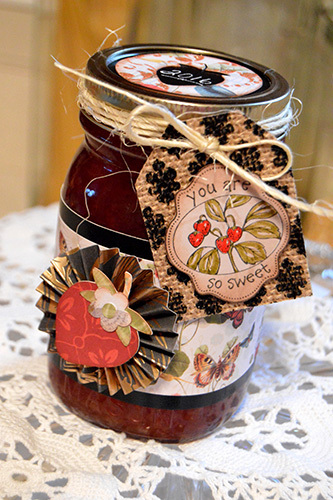 Obtain a pint jar (this one is filled with strawberry jam). Cut a strip from the DCWV Chalk Cardstock stack to 2-1/2”x10”. Adhere this to the center of jar with strong double-sided adhesive. Cut a 2”x10” strip of paper from DCWV’s Mariposa stack; adhere it to the center of the chalk cardstock jar band. Create a rosette by using the black with gold foil paper in the Mariposa stack. To do this, cut a 1”x12” strip of paper. Score every 1/4” across the 12” side. Accordion fold along the score lines and glue the ends together to form a circle. Form the paper into a rosette shape (push the top into the center) and hot glue it on top of a 1” circle of paper. Glue the entire rosette to the center/front of the jar. Cut a strawberry die cut at 1.8” using papers from the Mariposa stack and glue it to the front of the rosette. 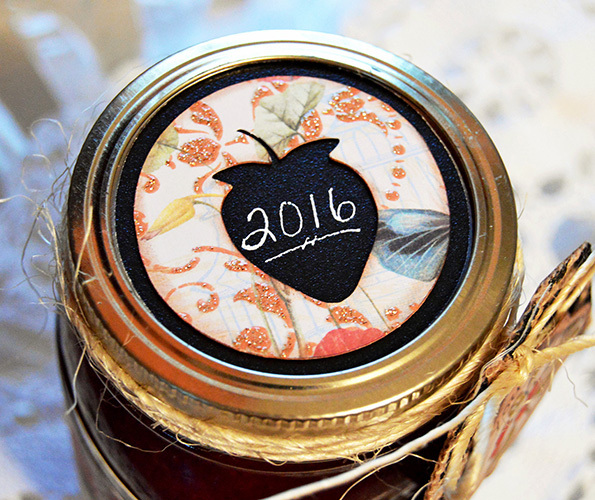 Cover the top of the jar with a piece of chalk cardstock. Cut a smaller circle from a print from the Mariposa stack; adhere this to the center of the chalk cardstock. Cut a tag from the 6x6 Printed Burlap stack. Add a sentiment to the front of the tag if desired. Punch a hole in the top of the tag and tie it to the band of the jar with twine.